Whether you are a Mompreneur, corporate manager, coach or hold the title of owner and CEO of your own company, having strong leadership skills is what will help you become even more successful in leading your own business or taking your career to an all-time high. It’s just a matter of unearthing and nourishing key elements of leadership to step into your full potential to lead more boldly and authentically. Leadership is essential to how we lead and serve in our daily lives. Nourishing our inner leader allows us to overcome what holds us back from becoming who we are meant to be. Showing up to be an exceptional leader to ourselves is a critical area many overlook as an important piece to thriving in life and business. Through my own personal experiences, I found my passion for studying and training on the subject of leadership as a former executive and Sr. Consultant for Fortune 100 companies. These experiences gave me a deep desire to advance in the workplace while equally being an ever-present wife, mother and caregiver. I was able to prove myself as a leader while understanding that my priorities are always family first! In doing so, it led me to become a better leader while achieving more promotions, accolades and opportunities. As the innovative Amazon CEO Jeff Bezos says, “constraints drive innovation. One of the only ways to get out of a tight box is to invent your way out.” So that is just what I did! As an authentic, bold leader I proudly strive to inspire the same from my clients by teaching them strategies to become authentic, bold leaders themselves and to cultivate that same leadership within their respective organizations and business ventures. My proven strategies are knocking down walls, breaking stereotypes, and debunking myths about the “cookie cutter” role we all need to play at work. What does being an authentic, bold leader mean? It means having the courage to be your authentic self and I encourage my clients to do the same through coaching techniques and tools to give them the HOW to make the transition and manage the impact of the change thereafter. My perspective is each individual’s unique story combined with 4 key elements – personality, passion, perspectives and pedigree – are what make up your authentic self. I have always had a deep passion and commitment for helping others. I work from my heart and I always strive to lead by example in presenting my most authentic self. I believe we are all natural born leaders and I am committed to proving it. Through my own growth, experiences and story, I now devote my life to helping others become authentic, bold leaders by discovering their innate leadership and harnessing their uniqueness and power. With my multi-faceted approach, I am able to help my clients quickly get to the bottom of their root challenges and provide valuable recommendations to take action and make changes starting from day one. I am also very passionate about supporting women who want to advance in the workplace or scale their businesses as mompreneurs as well as those who want to be an ever-present wife, mother, or caregiver. I strongly believe it is possible to have a successful career or business while being an involved mother. My work is now dedicated to helping others realize their full potential and I feel so deeply connected with the work I do, I see it has my personal ministry and mission to cultivate authentic, bold leaders, workplace cultures and environments. 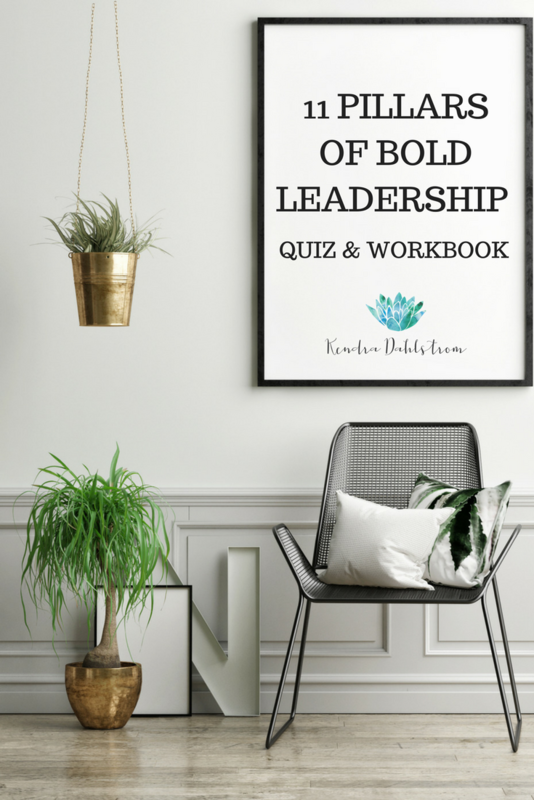 With my “11 Pillars Of Bold Leadership” workbook and quiz, you will have a deeper understanding of the principals and elements needed to be an authentic, bold leader. Growth comes from self-honesty and self-reflection so ensure you are taking your time to answer the questions honestly and objectively. Admitting that you have room to grow is not an admission of not being good enough and it’s certainly not a reason to allow self -doubt to creep in. It’s an opportunity to assess where you are right now in this very moment so you can not only take action but take the right action to move towards becoming the authentic, bold leader you were born to be. As you work through these 11 Pillars Of Bold Leadership it’s important to understand what leadership is and what it is not. It’s important to note our society today and work culture uses the buzzword authentic and does not accurately reflect leadership in its definition. It largely reflects fake authenticity and management. Think about it this way – you no longer need to be in “work mode” when you get to work. You no longer need to fit a cookie cutter image of who your workplace, society or clients expect you to be. You can be your true self – no shame, no guilt. Bad leadership is everywhere (thumbs down emoji) Good leadership is great. But authentic, bold leadership is even better as you can see from the list of admirable qualities above and it is these qualities that we are going to dive deeper together. So let’s dive deeper to discover YOUR authentic bold leader I know is dying to get out and serve the world! I can assure the perspective you will gain will be life changing!